Sun, Mar 24, 2019, 07:51 pm SL Time, ColomboPage News Desk, Sri Lanka. 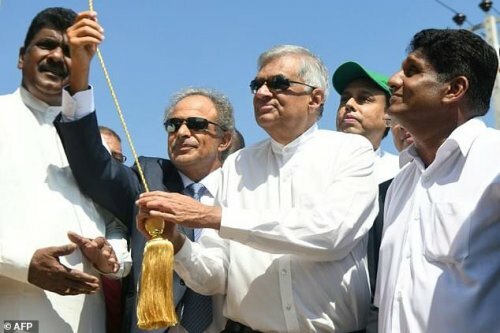 Mar 24, Colombo: Construction of an oil refinery with a nearly $4 billion foreign investment commenced today in the southern port city of Hambantota under the patronage of Prime Minister Ranil Wickremesinghe. Oman's Minister of Oil and Gas is Mohammed bin Hamad Al Rumhi, who arrived in Sri Lanka on Saturday, joined Prime Minister Ranil Wickremesinghe at the laying of the foundation stone for the Oil refinery in the Mirijjawila Export Processing Zone in Hambantota. The $3.85 billion project jointly funded by Oman and Singapore-registered Silver Park International is the single largest foreign investment in Sri Lanka's history. The project which is expected to be completed in 44 months will generate 10,000 direct employment. Addressing the gathering following the laying of the foundations for the new oil refinery and cement factory in Mirijjawila Export Processing Zone in Hambantota, Wickremesinghe said a robust foundation of development has been formed as a result of a sustainable policy framework. The Premier said Hambantota will be made a global investment hub with the addition of two mega projects- the oil refinery and a cement factory. He said the Hambantota investment Zone will change the entire economy. He added that steps will be taken to ensure that Hambantota will become the center of the Ruhuna economic development and special laws will be formulated for the purpose. The Prime Minister said the environment needed by the investors has been created. Speaking further Prime Minister Wickramasinghe, who is celebrating his 70th birthday today, said that the most valuable gift for his birthday was the Hambantota oil refinery and the cement factory. Mr. Wickremesinghe pointed out that a large number of projects that were white elephants have become procession elephants due to the government's policies of good governance. The prime minister said this was the first time an oil refinery was set up after building Sapugaskanda oil refinery in 1967. He said Mattala Airport would become operational within next 3 months with the assistance of India. The oil refinery will produce 200,000 barrels of refined fuel per day for the export market and is expected to be fully operational within four years. The cement factory can manufacture cement at a rate of 3.6 metric tons per year. This project is expected to be completed within 18 months and it will be expected to create 10,000 direct jobs. Minister Sajith Premadasa, State Minister Dilip Wedaarachchi, parliamentarians, and a large number of government officials participated in the event.